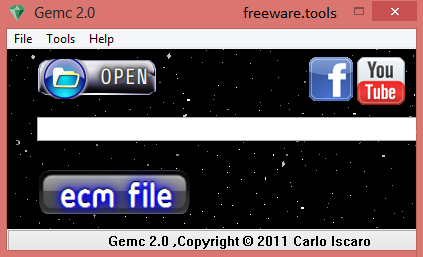 Gemc is a small portable tool whose purpose is to help you compress CD image files, such as BIN, CDI, NRG or CCD file format, using straightforward features. Gemc lets you prepare CD image files (such as BIN, CDI, NRG, CCD, or similar) so that they'll compress far better in programs such as WinRAR. Back up, transmit via Internet, or whatever you normally do with CD images. When you want to burn the CD again, extract the original CD image from the ECM file. Because this is a portable tool, there's no need to install it, hence no changes are made to your PC. The tool comes in a portable package which can be deployed on your system without having to go through installation steps. You only need to run the EXE file in order to open the utility. Good news is that it doesn’t leave any entries in your Windows registry and add configuration data so you can open it on the target computer without administrative privileges. Plus, you can store it on a USB flash drive or other devices and carry it with you. Gemc Portable reveals a clean layout that embeds most of its main features into a single panel. It doesn’t hide any complex configuration settings under its hood, so even rookies can easily get an idea about how to work with the built-in features. There’s no support for drag-and-drop, so you need to use the browse button for importing files in the working environment. Gemc Portable gives you the possibility to import a single file, so working with multiple items at the same time (more specifically batch processing) is not possible. You can compress a single file at a time. Aside from the aforementioned supported file formats in the beginning of the review, the application helps you add ECM files as well. On the downside, the utility doesn’t let you pick the saving directory, so by default the compressed items are saved in the same directory as the input files. What’s more, you are allowed to terminate or suspend the current compression task, estimate the remaining time with the aid of the progress bar, check out the percentage of the encoding process, view a log which contains information about the compression operation and possible errors. You can also the input and output directories directly from the main window. Last but not least, you can make file associations for the ECM file format. All in all, Gemc Portable delivers a simple software solution for helping you compress CD image files, and is suitable for all types of users, regardless of their experience level.